Notable for the monumental grandeur of his religious paintings and portraits, Sebastiano del Piombo became the preeminent painter in Rome following Raphael’s death in 1520. 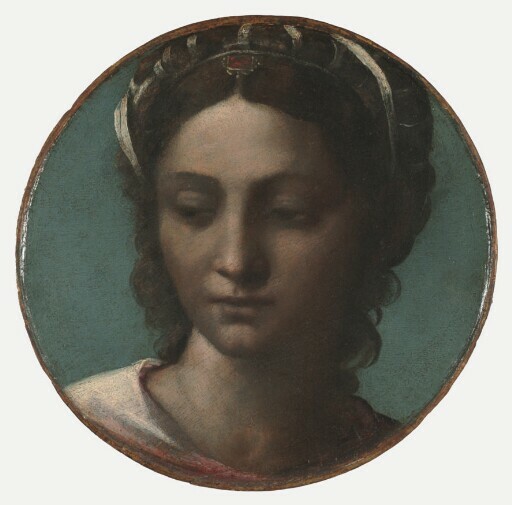 Following his Venetian training with Giovanni Bellini and later Giorgione, Sebatiano traveled in 1511 to Rome, where he frescoed parts of the Villa Farnesina. An intense rivalry soon developed with Raphael. This was encouraged by Sebastiano’s friend Michelangelo, who supplied him with drawings for some of his paintings. Sebastiano produced some of the finest portraits of his day, a number of which were later mistakenly attributed to Raphael and Michelangelo. In 1531, Pope Clement VII rewarded him with an appointment as Keeper of the Papal Seal (piombo)––the name by which he came to be known. This majestic head is an essay in ideal beauty of the type known as a testa ideale (ideal head). Sebastiano has emulated the smooth and abstracted facial structure found in classical sculpture––here reflected in the high, straight bridge of the nose and the downcast, half-moon eyes––and employed soft tonal transitions in the woman’s skin to achieve a strong three-dimensional effect. purchased by Kimbell Art Foundation, Fort Worth, 1985.